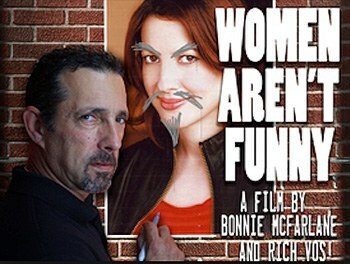 Bonnie McFarlane spins comedy gold in this feminist fish out of water memoir. 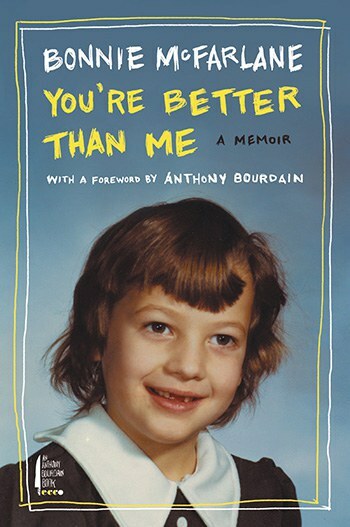 This review singing the praises of Bonnie McFarlane’s new memoir, You’re Better Than Me, will be delightfully easy to write, because she’s very helpfully provided “Appendix C: How to Properly Give a Compliment to a Working Comedian”. Assuming these compliments cross-apply from comedy shows to comedy books, here are my options, to paraphrase from McFarlane: I can state my enjoyment and reflect that I had a good time, I can describe the show as fun and the comedian as funny, and I can say thank you. Indeed, I’ll gladly employ all three of those compliments for You’re Better Than Me. This book was a good time to read, indeed. One of the main reasons that it felt nice to read was that I often do not have “the appropriate emotional response to things”, which McFarlane considers to be the generative bedrock of all comedy as well as the source of an audience’s responsiveness to comedy. The book’s first chapter drills down into Wikipedia’s entry on seven signs of serial killers, analyzing via unusual childhood reminisces how close she came to being a criminal but ended up a comedian instead. Maybe this is a good time to mention that McFarlane is Canadian. She is also an enjoyable read on a more serious level, which is due to her astute rendering of the many horrific particularities of being a female comedian. For those who loved her 2014 “cockumentary”, Women Aren’t Funny, this text is a gloriously personal trek into the anecdotal evidence supporting how thoroughly sexist the comedy playing field is. Where the film leans on a cornucopia of funny ladies to give their opinions, this book unloads McFarlane’s own laundry list of largely factual occurrences. And yet, she does many of the worst offenders the courtesy of anonymity when she could have instead written a real tell-all that calls out funny dude culture. True to her form on stage, McFarlane stays fierce without tipping over into scathing. When discussing other human beings, she’s simply never mean about it. She reserves the truly harsh barbs for herself, focuses punchlines on more broadly appealing types of vulgarity, and only uses names of other comedians if she is acknowledging them in a positive manner. The exceptions to this would be her personality profiles of Rich Vos, her current husband who agreed to be ridiculed when he put a ring on it, and Marc Maron, her long-ago long-time boyfriend who shouldn’t dish it if he can’t take it. She keeps it fun throughout. And she keeps it funny, despite shifting in and out of a few different non-fiction modes. The beginning of the text is most directly in line with classic memoir, and as readers turn more pages, they will feel the author’s compulsion to turn back toward something fragmentary and more in the vein of her stage show. By the end, she’s engaging in outright reflection on her own progress as well as dispensing advice to aspiring comics. The beginning of the book uproariously mocks this tendency of veteran comics to want to drop their infinite wisdom on the newbies. The things McFarlane is most annoyed by in others are frequently revealed to be things she dislikes about herself -- she’s always in on the hypocrisy and the hilarity of that. I’m trying to do justice to the book’s content, but I’m also trying not to spoil it for you by relaying any of the most funny material in it. Just go pick up a copy of You’re Better Than Me and revel in all the tiny ways that you're actually neither better nor worse than its author. You’ll thank me. I’ve got to thank McFarlane, as well. For the book, yes, but moreover, for a great anecdote that accurately reflects much about the book’s content and vibe but is not itself in the book and therefore contains no spoilers. You see, once upon a time in a kingdom far away, my wife used to be a professional comedian. She and McFarlane sometimes had occasion to work together. I have never personally shared airspace with McFarlane, but she’ll easily convey to you repeatedly throughout the book the fact that her airspace used to be saturated with a fine fog of marijuana. The first time my wife got high, it was with thanks due to McFarlane. Their little baggie of sad, brown flakes came with one rolling paper stuffed into it. Back at the hotel ready to roll up, they discovered that one paper was torn in such a way as to prevent the production of a structurally sound joint. While my inexperienced wife bemoaned their bad luck, McFarlane spun her head with slow and steady resolve toward the nightstand where, as we all know, one can generally find a copy of the exceedingly thin-papered Gideon Bible.